This text excerpt from Alan Hall’s fascinating live presentation explains that social mood influenced the demand for particular technologies and inventions during the past 1,500 years: Confident peaceful societies developed technologies which created wealth and raised living standards, while fearful and angry societies pursued technologies designed for defense, survival and even to dominate others. Here is an excerpt of the video transcript. Mediterranean civilization peaked around 50 AD. 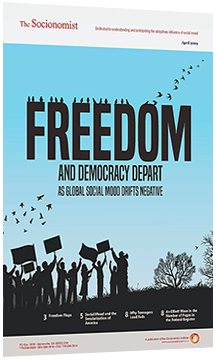 From there, social mood began a four-century trend toward the negative that impelled increasing fear and anger. In 476, the Roman Empire collapsed. People wanted to fight on horseback. Inventors obliged. “Greek fire” appeared in 672 during the heart of the Dark Ages. Soon after came the iron stirrup and the curb bit. The next trend toward negative mood brought the crossbow, the iron horseshoe and black powder. The English longbow appeared just prior to 1066. During the next positive wave, horse breeding improved. Jousting, tournaments and chivalry, with codes of courage, honor and service, became increasingly popular. Just before the Black Death, the knight-on-horseback paradigm collapsed, a victim of classic asymmetrical warfare. As depicted in the movie Braveheart, Scots defeated British cavalry with pikes at Falkirk. The Flemish defeated French cavalry at Courtrai. And beginning in 1315, the Swiss used poleaxes, called halberds, to win spectacular victory after victory against armored horsemen, helping to bring down the entire feudal order. Even as warriors reverted back to spears and axes, the next weaponry paradigm was born, the earliest known gunpowder weapon in the West: a crude cannon. In the late 1400s, the musket replaced the crossbow. After social mood had trended positively at large degree, the telescope appeared in 1608. The intense pessimism of the 30 Years War encouraged the development of small arms. Watch Alan Hall’s presentation on video and learn how social mood trends drove technological inventions in the nineteenth, twentieth, and twenty-first centuries.